Disposable bioreactors have recently appeared as a technology of choice for culturing cells at large scale. That said, most existing disposable bioreactors are efficient for viral or protein biomanufacture but are not appropriately adapted for fragile stem cell production, which requires highly sensitive niche microenvironments. The upside of disposable bioreactors is that they can easily be operated with process control systems that allow monitoring of important culture parameters like gas flows, temperature, pH, dissolved oxygen levels, and agitation speed. These factors, in addition to growth surface material and shear stress on the cells, can drastically affect the way the cells grow and differentiate. At the end of the process, the harvest of the cells represents another challenge. It is also important that the process has been well-documented and can be validated throughout. If this is not the case, any cells cultivated in 2D culture vessels may have critical flaws that could lead to the need for intense revalidation of cell integrity. ATMI LifeSciences developed the Xpansion™ bioreactor system to overcome these issues and enable stem cell culture scaleup (Figure 1). It is designed based on stacked plates that have been made from the same plastic material as multiple tray stacks. By maintaining a consistent environment for the cells, the process is easily transferable from the multitray-stack into the Xpansion bioreactor. This also helps mitigate regulatory risks. Each Xpansion plate has a surface area of 612 cm2, which is similar to the size of a plate in a multitray stack, but the difference is in the layout. Typically, the gap between the plates in a stack would be around 15 mm. By shifting the gas exchange in the central column, this gap is greatly reduced in Xpansion. As a result, the largest Xpansion unit is 80 cm high yet contains 200 plates with a gap of just 1.6 mm between each pair of plates to keep the same ratio of medium per surface as in multitray stack. The capacity of 122,400 cm2 means that one Xpansion bioreactor can replace up to 20 traditional stacked trays. 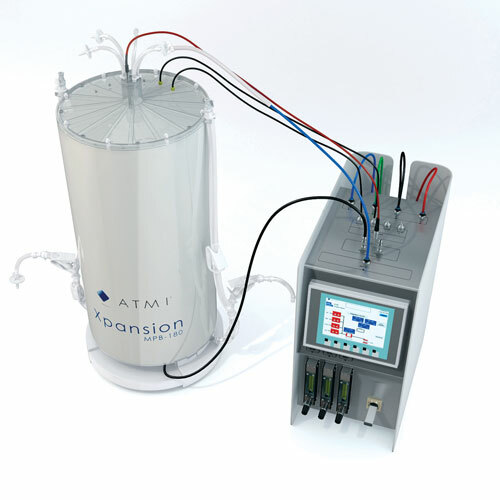 The Xpansion bioreactor is attached to a digital controller unit on a separate skid that includes all the necessary control and measurement hardware. It also incorporates a gassing system that is connected to gas supply lines that, in turn, are connected to the gas-in filter on the bioreactor. Air, oxygen, carbon dioxide, and nitrogen options can be used to create the correct composition of gas for injection into the bioreactor. Gas aeration occurs depending on pH and dissolved oxygen (DO) measurements in the bioreactor. The gas coming from the controller enters via the gas-in filter of the bioreactor and passes through very thin silicone tubing placed in the central column. The gases are then diffused through this tubing. Medium circulation at a minimum flow of 1–2 mm/s is coupled with the aeration system when required to minimize the shear stress. Each plate contains 16 radial channels supporting media circulation through the plates. A magnetic impeller at the bottom acts as a centrifugal pump to support smooth medium circulation. The liquid is sucked from the central column, pushed to the bottom and then flows sequentially over the plates from bottom to top. Once it reaches the top, it is returned to the bottom of the stack, via the column central, where gas exchange occurs. Any changes in the surface the cells adhere to, or minute differences in the conditions within the bioreactor, can have a dramatic effect on the growth process and even the morphology of the cells. As such, it is imperative to keep the environment as stable as possible throughout the cell growth process. The digital controller makes a series of measurements to determine how much of which gas it needs to inject into the bioreactor to maintain the pH and DO limits set by the operator. If the pH is too high, then the controller will inject carbon dioxide to decrease it to the correct level. Injections are in combination with a transporter gas, either nitrogen or oxygen, depending on the DO level within the bioreactor. Conversely, if the pH has fallen too far, either air or oxygen (depending on DO level) will be injected to strip the medium in the bioreactor of excess carbon dioxide. There are two alternatives if DO reaches too high of a level: either it can be decreased by injecting nitrogen, or it can be left to fall naturally until the DO returns to the dead band with the oxygen being consumed by the cells. If it is too low, then oxygen is injected. Again, this action will cease once the DO value is back in the correct range. The pH and DO trends are highly similar between the scales of the bioreactor (Figure 2). DO and pH are regulated alongside the culture. The pH and DO readings were similar across both cultures giving an indication that the process is repeatable. The Xpansion system design enables an operator to observe the first 10 top plates of the bioreactor using an iLine® (Ovizio) holographic microscope for observing cell morphology and confluence alongside the different culture. The mesenchymal stem cells (MSCs) are shown displaying fibroblastoid morphology and the automated cell counting of the microscope help to optimize harvest time. To evaluate the effectiveness of the Xpansion system, a control study was performed. In the study, mesenchymal stem cells were consecutively cultivated in a 10% serum-containing medium in three scales of Xpansion bioreactors (10, 50, and 180 plates). For each experiment, MSCs were also cultivated in a cell culture control system. Figure 3 represents the percentage of the cell densities obtained at harvest in XP-10, XP-50, and XP-180, compared to those obtained in the control. It shows that equivalent cell densities were obtained with strong characteristics. 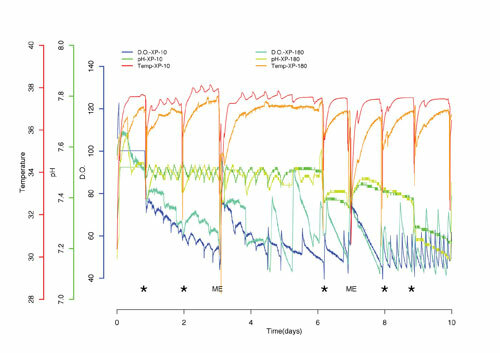 Roughly 30,000 cells/cm2 were achieved after 6–10 days depending on the cell lineage and the serum batch (not shown) with viability above 97%. The Xpansion bioreactor includes a sampling port enabling metabolites follow-up. Metabolites profiles are similar (not shown), and demonstrate that the cell behavior has not been affected by the cultivation in the Xpansion system. Moreover, QC tests (FACS, ICC) performed with cells harvested from the Xpansion system demonstrated that cells keep their stem cells identity and their potential to treat the disease under study. These experiments proved the viability of the ATMI Xpansion bioreactor as a vessel for growing mesenchymal stem cells. The cells adhere and grow in a similar manner to lab-scale 2D culture vessels, which means that scaling up has not impacted the morphology of the cells.